With all the hoopla surrounding Twitter these days, I thought it might be useful to devote a Bugs & Fixes column to this social networking site. Here’s a look at a trio of issues you might have experienced when trying to share your 140-character thoughts with the world. Last week, I decided to change my profile image in Twitter. Things did not go well. At first, the Twitter software refused to accept my new image. When I tried again later, Twitter claimed to replace my old image with the new one. However, when I checked, I found I now had no image at all! Eventually, after a few more tries, I was able to get things to work as expected. It turns out that am not the only one to have had this problem. Twitter is aware of the issue and is working on a fix (as confirmed in this note on trouble with updating your profile settings). That’s the way it’s supposed to work at any rate. Starting last week, all messages were identified as “from Web.” There was nothing you could do to fix this minor nuisance. (“Minor” to most people anyway; third-party client developers may have a different outlook.) The solution required a fix from Twitter itself. Happily, this bug has now been fixed. Twitter’s ‘from web’ -- a problem that’s since been fixed. Have you ever attempted to refresh your Twitter listings and received a “bad request error”? This message has nothing to do with the politeness or moral value of your tweets. Rather, Twitter limits how often you can request to connect to its servers. The reason for the limit is to prevent their servers from being overloaded with too many requests. Currently, the limit is 70 connections every hour. If you exceed that amount, you’ll get the error and have to wait a bit before you can refresh again. Don’t think that shifting to a different Twitter client, or shifting from your Mac to your iPhone, will work around this limit. The connection numbers for your account are tallied at the Twitter server, no matter where your tweets or refreshes may originate. Seventy connections per hour may seem more than you need—but not necessarily. If you are using a Twitter client, it is likely set to refresh itself automatically after a given interval. 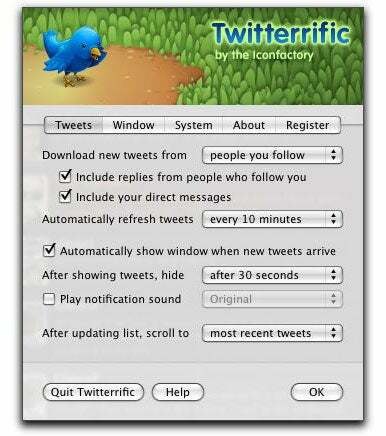 For example, Twitterrific’s default setting is to refresh every 3 minutes. This may seem to translate into 20 server requests per hour. Unfortunately, as pointed out on this Twitterific support page, each refresh counts as three server requests (one each for recent messages, replies and direct messages)! This means that the default settings alone account for 60 out of your 70-per-hour connection limit. If you often manually refresh or start posting several tweets in a row, you can easily surpass the limit. You can change the interval for automatic refreshes in Twitterrific. If this error often happens to you, what can you do? You can lengthen the interval for automatic refreshes, thereby reducing the number of automated connections per hour. For example, in Twitterific, you can adjust the interval from every 3 minutes to every hour or even never. I currently use “every 10 minutes,” and have never had the error message pop up. By the way, to see these error messages in Twitterific, you need to make sure that the preference to “Show errors in tweet list” is enabled. Unfortunately, turning off the messages will not prevent the time-out if you exceed the limit. It just turns off the notification.